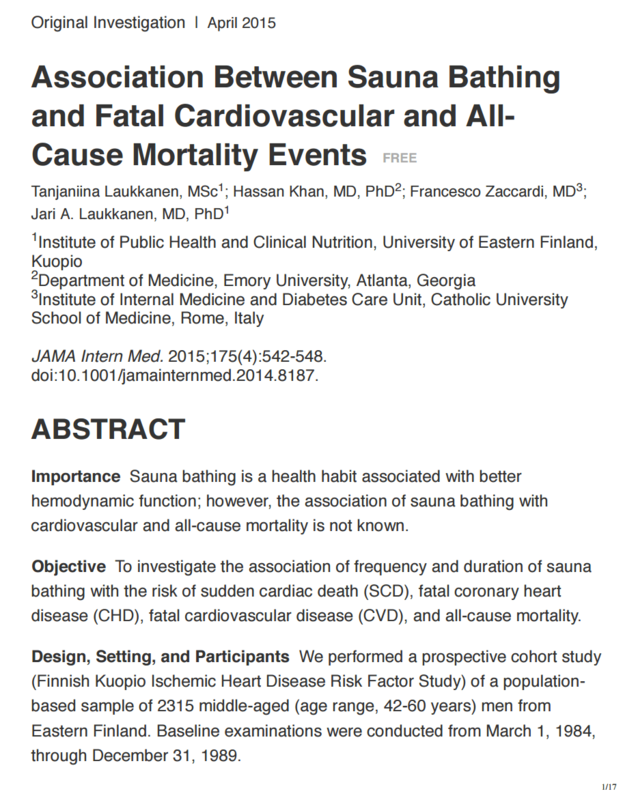 Researchers at the University of Eastern Finland set out to study mortality rates and cardiovascular incidents in over 2,000 middle-aged sauna bathers in Finland, and published their findings in the Journal of the American Medical Association (JAMA). Read the study here. Most home saunas are infrared saunas, as you might expect, since infrared heaters can be quickly switched on or off and don’t require a long waiting time to heat up. A common question for many people considering buying a home sauna, whether it be infrared or otherwise, concerns what the health benefits of saunas might be, and whether the alleged benefits are real or more likely to be hokum. Fortunately for this question, a newly published 2015 longitudinal study out of The Journal of the American Medical Association (JAMA), conducted by researchers from the University Of Eastern Finland, contains perhaps the best data ever collected in a scientific study about saunas. We are fortunate now to have a longitudinal study spanning 20 years of Finnish sauna use, with some compelling correlations. After those 20 years, the mortality rate of those who used saunas 4-7 times per week was 18.3% lower than it was for participants who used saunas just 1 time per week, with a similar trend line in cardiovascular problems. And for a study about saunas, who would you rather have as both the researchers and participants than the Finns? With a population of 5.5 million people, there are around 3.3 million saunas in Finland–about equal to the number of TVs and starting to approach having as many saunas as there are people! Saunas are a part of Finnish daily life. Longitudinal studies are rare simply because they take a lot of effort and time–decades in this case. So let’s dive in a bit and see what information we can glean from the details of such a valuable investigation. Researchers studied 2,315 Finnish middle-aged men, ages 42-60 years old, over the course of 5-and-a-half years in the 1980s. (Well, actually it was 2,327 participants who completed their information, but 12 of them didn’t use saunas. And you call yourself a Finn! They were omitted from the study.) The participants answered questionnaires about their self-reported typical sauna use, then took the temperature of their typical sauna experience, and submitted themselves to health examinations to identify health risks that might influence their personal outcome. Then, demonstrating the extraordinary patience seen only in longitudinal studies, the researchers waited 20 years and then started gathering reports on the health outcomes of all the participants. They compared those health outcomes to the self-reported sauna use stats, and got a pretty remarkable correlation. During the follow up, the researchers found that 49.1% of participants who reported using the sauna once per week had died, while 37.8% of those reporting sauna use 2 to 3 times per week had died, and just 30.8% of those reporting sauna use 4 to 7 times per week had died. That’s a mortality rate difference of 18.3% from the cohort with the lowest sauna use to that with the highest sauna use, and at least an interesting correlation. Sauna health benefits are mainly associated with the cardiovascular system, so the researchers made cardiovascular and heart disease the main focus of their study. Similar to the overall death rate, the instances of cardiovascular disease in the cohorts were 22.3% for participants reporting using the sauna 1 time per week, 16.4% for participants reporting sauna use 2 to 3 times per week, and down to 12.0% for participants reporting sauna use 4 to 7 times per week. Overall, there was a relatively pronounced trend line down in this study for both overall mortality and cardiovascular disease as the participants reported more sauna use. 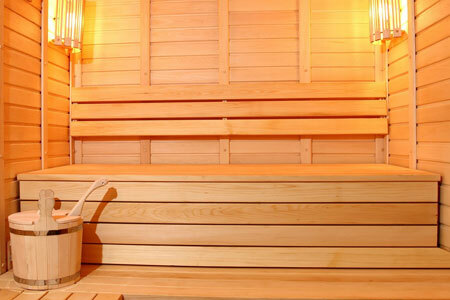 Why Might Saunas Benefit Health? Finnish saunas are typically very hot and dry, with occasional pouring of water over stones for steam. Additionally they are social and relaxing in nature as a regular part of daily life, something to keep in mind when assessing these results. The authors of the study discuss the increased heart rate and lower blood pressure that occurs during and after typical sauna sessions. Skin blood flow increases, leading to higher cardiac output, and sweat is secreted at a higher rate. Of course, these are all effects that happen during standard physical exercise, so it’s possible that sauna bathing, though a stationary activity, may provide a portion of the benefits that exercise does, namely through working out and strengthening the heart and lowering blood pressure. Of course, that does bring up some vital concerns. For instance, your heart should be strong enough to deal with the increased strain from a sauna session in the first place, otherwise you could actually increase your chances of an immediate heart problem. Also, due to the amount of water weight lost during a sauna session, you should be well hydrated and not have been drinking recently to safely enjoy a sauna session and avoid immediate adverse events. While such a large longitudinal study is fantastic to have now to be able to assess the health benefits of using a sauna, there are of course some limitations to the study and the conclusions we can draw from it. Firstly, only Finnish men from one region of the country were studied, and they all used saunas on a regular basis. There weren’t any Finns included who don’t use saunas regularly (presumably because there aren’t many! ), so we can’t compare the longitudinal data in sauna-using cohorts to a non-using cohort. And we may not be able to extrapolate to a cohort of women, who are on average less susceptible to cardiovascular problems than men. Also, the Finns in general may be more tolerant of sauna sessions than other peoples, because it’s such a prominent part of daily life, and a person who has not grown up bathing in saunas might experience more stress from the sessions than the participants of this study. And naturally there’s a potential selection bias at play in the results, as people who are more likely to be in the sauna more often on a regular basis may also be more active in other areas of their life as well, and may be more affluent in general to be able to afford easy access to a sauna (although there is certainly no shortage in Finland). The authors discuss some of these limitations and more in their article, as well as encourage other studies to further extend the research in hopes of learning more. Additionally, a subsequent article in the same journal by two UK PhDs and a Finnish PhD call in to question any causal relationships between the sauna use and health outcomes in the study, in part due to the second set of confounds mentioned above. While it is important to retain a healthy sense of skepticism and avoid sensational coverage of scientific studies like this, there are some promising results in this study, the first of its kind with regards to saunas, that are worth consideration and could yield further insight into the potential health benefits of sauna use. It’s also important to note the type of sauna bathing the Finnish participants of the study use. The mean temperature for a Finnish hot sauna session in this study was 79°C (174°F), which means we can’t directly apply any of the findings to steam rooms, hot tubs, or other types of heat sessions that don’t operate at such a high temperature. Finnish saunas are typically very hot and dry, with occasional pouring of water over stones for steam. In addition, the average length of a sauna session in the study was 14.2 minutes, with a standard deviation of 7.5 minutes. Also, the very nature of saunas in Finnish life is social and relaxing. It’s designed to reduce stress, and etiquette dictates that controversial topics should not be discussed while bathing. So if you’re looking to achieve the health benefits that were correlated with sauna use in this study, try to set your sauna experience up in a similar fashion–relaxing, maybe even social, and a high enough temperature. Do These Potential Health Benefits Apply To Infrared Saunas? 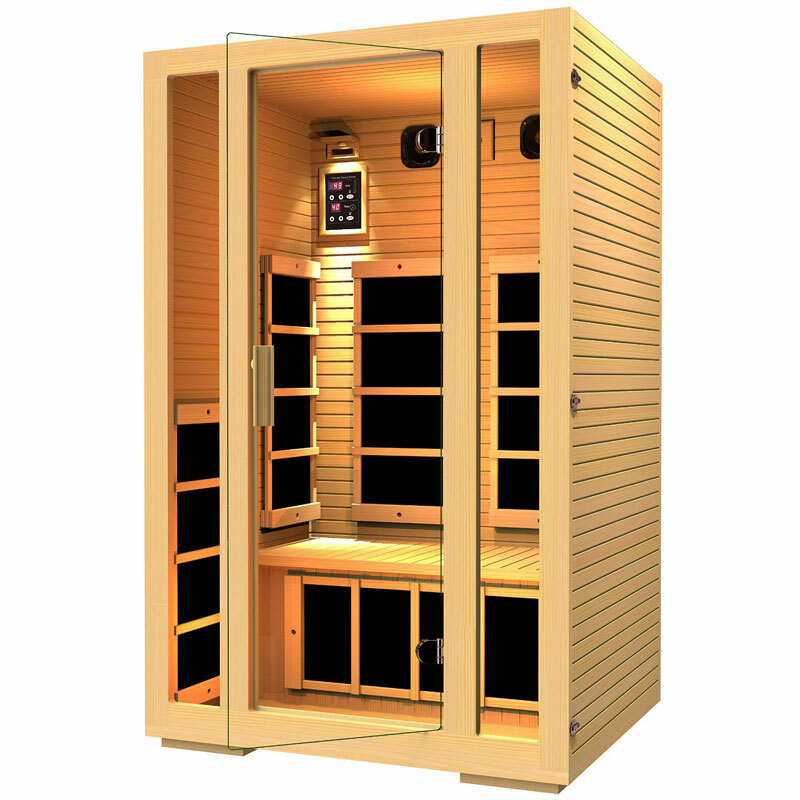 Infrared saunas are great for home use, since they heat up fast and are often cheaper than traditional saunas. 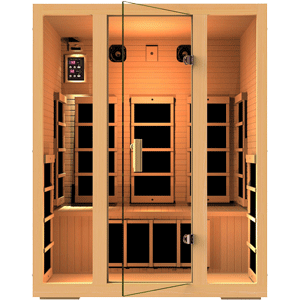 While most infrared saunas may max out at around 140°F, the infrared heat actually makes it feel hotter than that because the surface of your body is being heated directly rather than just the ambient air of a traditional heater. 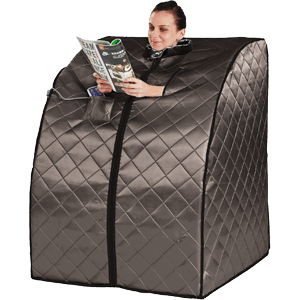 So the heat effect on the body produced from an infrared sauna could compare pretty similarly to the heat effect of a traditional Finnish sauna. So if you’re looking to achieve these potential health benefits, ensure that you’ve modeled your sauna environment in a similar fashion to the study’s Finnish participants. You’ve created a stress-free and relaxing space, you’re running the heat high, you make a session long enough, and take all standard sauna safety precautions, such as being hydrated, alcohol-free, and otherwise in good enough health. We hope you enjoyed learning about this study! You can find the full study here if you’d like to read the direct source. It would be amazing to have some additional longitudinal studies, including one of non-sauna users, traditional sauna users, and infrared sauna users in the same pool. Let’s hope somebody is on it! Are There Health Benefits To Sauna Use? Researchers at the University of Eastern Finland set out to study mortality rates and cardiovascular incidents in over 2,000 middle-aged sauna bathers in Finland over 20 years ago. In 2015, the results of this first-of-its-kind longitudinal study of sauna use were published.